Doctor Who: Tony's Top Ten Non-Spoilery Quotes From THE GIRL WHO DIED | Warped Factor - Words in the Key of Geek. I’m under attack from four and a bit battle fleets in case you think I’m slacking. No, no no, not Vikings. I’m not in the mood for Vikings. People talk about premonition as if it’s something strange; it’s not – it’s just remembering in the wrong direction. What’s the one thing the gods never do? They never actually show up! What are you gonna do? Raise crops at them? Do babies die with honour? You’re Lofty. You’re Daphne. You’re Noggin The Nog. ZZ Top. And you’re…Heidi. So we’ll try that again. The Big Bang. Dinosaurs. Bipeds and a mounting sense of futility. Reversing the polarity of the neutron flow. Bet that means something, it sounds great. I can do anything. There’s nothing I can’t do. Nothing. But I’m not supposed to. Ripples, tidal waves, rules! I’m not supposed to- Ohhh… My face. Who frowned me this face? You’re going to want to check out Satellite Five on a regular basis, not least because that’s where Tony’s spoiler-free reviews of Series 9 episodes will be appearing first. So go now to read the spoiler-free review of The Girl Who Died. 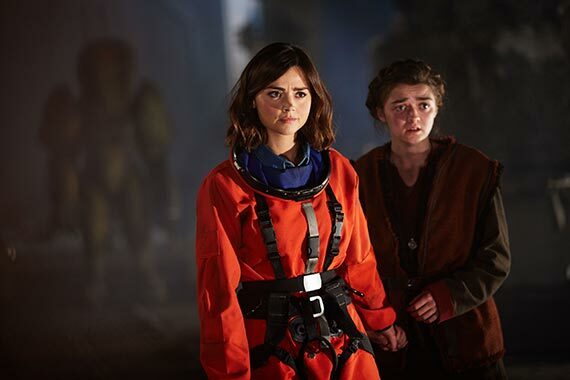 The Girl Who Died premieres Saturday 17th October at 8.20pm on BBC One.